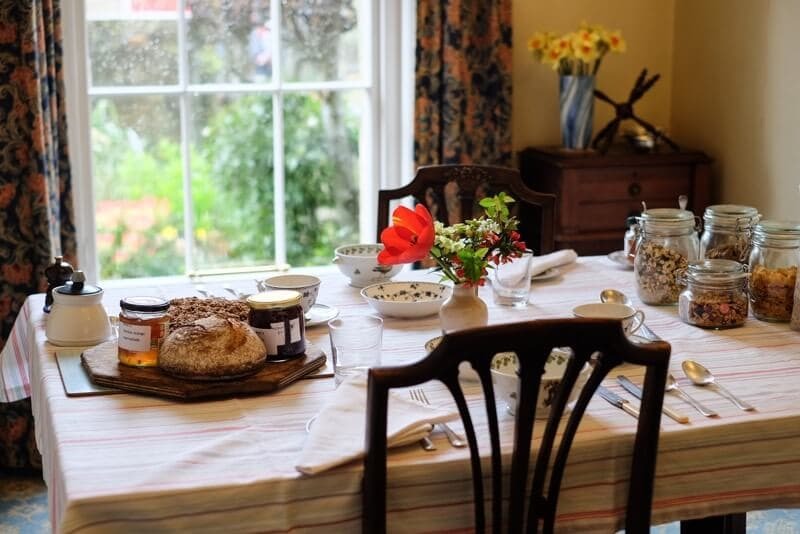 Breakfast is a leisurely start to the day, with organic produce sourced locally and served with a smile. We offer a full Scottish breakfast, organic porridge with cream and maple syrup, Mike’s legendary fruit salads, and a Continental breakfast. Many of our ingredients come from Edinburgh Farmer’s Market. Our daughter, Caroline, has her own organic bakery in the New Town, and each morning we serve a variety of her delicious and healthy breads. Ann makes her own Irish soda bread and yoghurt. We make all our own jams, picking the fruit ourselves from Border Berries near Kelso. We gladly cater for vegetarians, vegans and all dietary requirements. Advance notice is always helpful. Mike & Ann care passionately about offering “ A Taste of Scotland” at breakfast. © 2019 Tantallon Place B&B All rights reserved. Website by newmediabureau.